A lot of not-working or unrealistic Airsoft-mines are available on the market, and almost all of them work by a pressure trigger. There cannot be any hope to hit the target with a single mine in a vast playground. 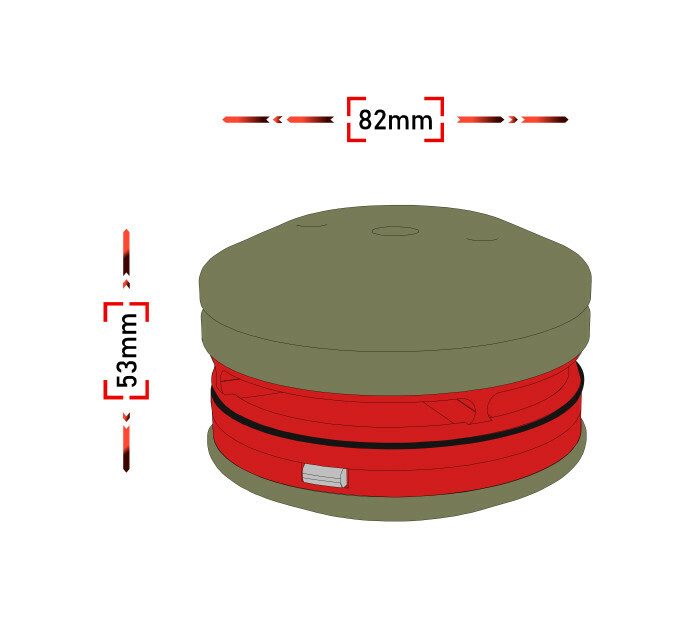 Hence the idea of ​​Enimine, a technological and innovative bouncing land mine for Airsoft, with remote trigger by a microwave radar and the total coverage of a perimeter of about 5 meters. 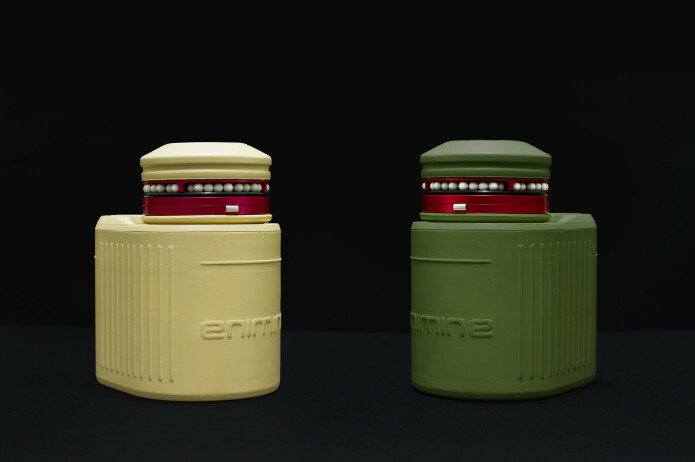 Unlike other common land mines, Enimine has a microwave radar which can be activated with an RF remote control; it detects movements in a PERIMETER of about 5 meters and it triggers the launch and, subsequently, the detonation of the bouncing mine refilled with gas and BB’S. The gas shoots BB’s in all directions up to a distance of about 7 meters. It is equipped with a disarm system, just hit it for 3 times and Enimine will trigger and detonate. In the case of not triggering, Enimine can always be deactivated via the RF remote control. In addition, the mine trigger can also be activated instantly by pressing the appropriate button on the remote control. Enimine can be buried for ¾ of its body, becoming practically invisible to the human eye. Many of the Enimine parts are made of high quality ABS, while the rest is made of aluminum and steel. 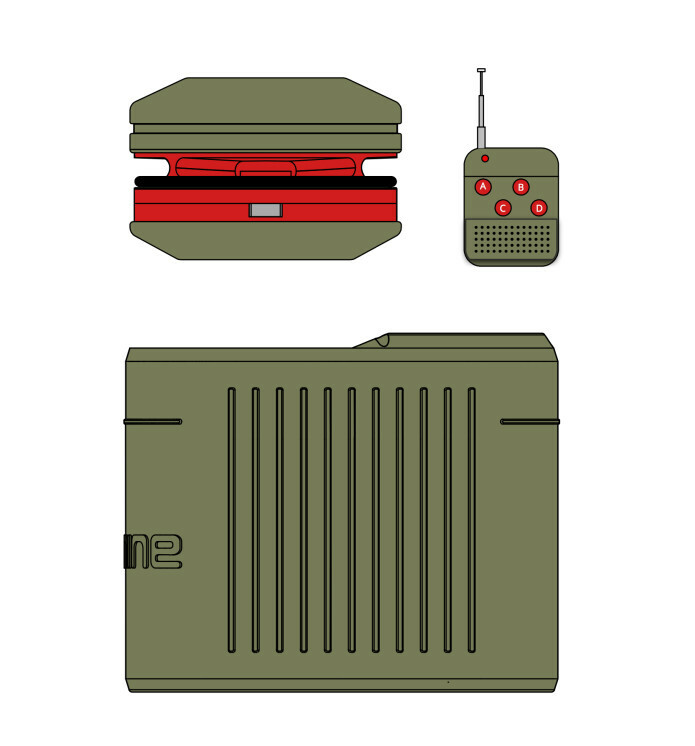 Enimine is mainly composed of three parts: the bouncing mine, the launch base and a RF remote control. The bouncing mine is made of aluminum with an outer foam coating. The foam allows a lightening and a high shock absorption capacity, in order to avoid damages and dents. It’s refillable by gas and it contains up to a maximum of 92 BB’S. The ABS launch base contains a trigger system, a servo motor, an electronic board, a battery, a spring system. The release group is composed of two steel levers enclosed in an aluminum box, a combination that allows a high reliability and durability over time. The levers are operated by a servo motor. 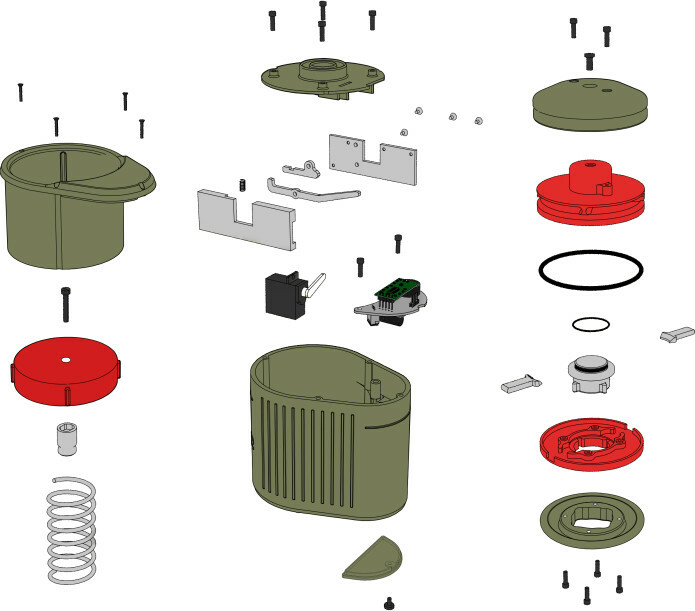 The piston, under which a compression spring is located, is made of ABS. An aluminum pin, screwed to the piston, is fitted to the “trigger system” by keeping the spring pressed. The electrical impulse is supplied to the servo motor by the electronic board, the mind of Enimine. The electronic board manages all of the electrical components . The entire system is powered by a 7.4v lipo battery with an integrated overcharge / overdischarge protection system. The electronic board is managed remotely by an RF remote control that works on 4 channels, each one with its own specific function. Enimine has a quick and easy use. Connect and store the battery in the compartment located at the bottom of the base. When the battery is connected, an acoustic signal indicates that the system is on and in stand-by mode. Load the 4 cavities of the bouncing mine with the BB’s, then you have to push the cap placed in the lower part of the mine till it is stuck. 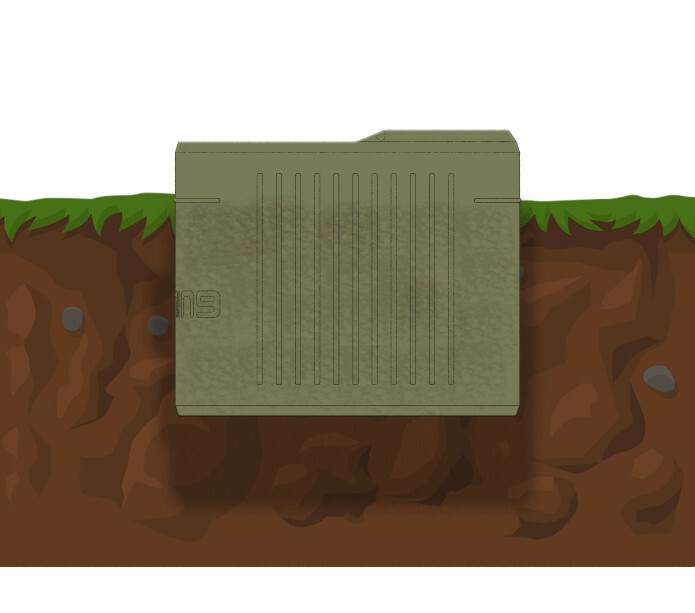 Once the bouncing mine is based on the piston, it must be crushed until it is stuck in the trigger system. Then you just have to refill the bouncing mine with green gas for 3 or 4 seconds through the valve on the top. Now, let step away and activate it with the RF remote control. Enimine will take care of the rest. 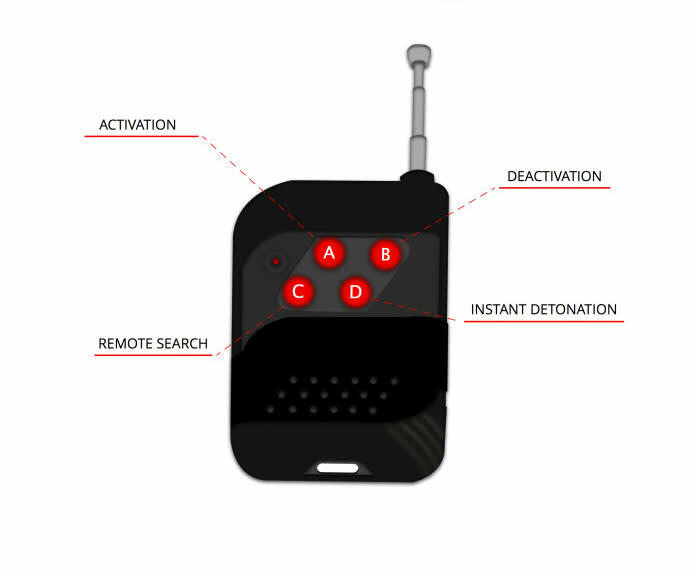 Both the activation and deactivation are indicated by different acoustic signals, as well as the search function and the “low battery” function. The small size makes it a versatile and portable accessory. It can also be buried for ¾ of its body and this limit is indicated by 2 horizontal lines placed on the external body. Vertical lines, on the other hand, have the function of grip. The bouncing mine has a size of 82 x 53 mm and a weight of 190 grams. The bouncing mine is composed of two aluminum shells covered with foam parts, an o-ring, a gas charge valve, two locking pins and an o-ring cap to seal the inner tube. The aluminum parts are red anodized, in order to make it easily identifiable in wooded areas. The jumping mine has 4 slots where you can insert up to a maximum of 92 BB’s, while the o-ring has the function of not letting them fall once inserted. The cap, which is located under the jumping element, serves to open and close the inner tube and works in conjunction with the two locking pins. In the event that you try to press the jumping mine into the expulsion cylinder without having previously closed the tube, the locking levers won’t allow it to enter. This means that the jumping mine can be refilled with gas only if it is pressed in the base, making the device safer in case of malfunction.The jumping mine is reusable and refillable with gas and BB’s. The microwave radar has a maximum range of 5 meters radius, beyond which the launching system and, subsequently, detonation system are triggered. The radar is able to detect only organic movements (humans and animals), avoiding the trigger in the case of the passing of any other type of inanimate object. It can detect movements even through small thicknesses such as doors, grass and foliage. The radar has an activation delay of 20 seconds, countdown that starts only when no more movements in its perimeter are detected once it is activated via the RF remote control. The RF remote control has a range of 50 to 80 meters, depending on obstacles, and it is powered by a 12v battery. Each function of the RF remote corresponds to a different sound emitted by the buzzer. The Enimine battery, with 25 x 48 x 17 mm size, is a 7.4v 500mah 20c Li-po . The supplied battery lasts about 10 hours with the system activated and about 50 hours with the system in stand-by mode, with an indicative number of releases equal to 60 / 80. It can be recharged with standard chargers for 7.4v / 11.1v Li-po batteries commonly available on the market. The servo motor is activated when the radar module detects movements and / or when the launch base is hit for several times and / or by pressing the specific button on the RF remote control. The servo lever moves the trigger group levers, which release the previously locked piston’s pin. The piston is pushed upwards thanks to the steel spring. The jumping element, in turn, is pushed out of the base by several cm of height. Following activation of the servo motor, the system comes back to stand-by mode. Once we had the original idea for Enimine, the design process began by developing the release mechanism and the gas compression system, an essential step for the feasibility of the project. For the first prototypes a FDM (Fused Deposition Modeling) 3D printer was used: this allowed to have, in a short time, different shapes of different sizes, giving us the opportunity to test the efficiency, functionality and the perfect trajectory of BB’s. From here we have selected and worked on the most suitable shape, refining the design and size, and we reached the most compact and versatile one. After the tests on the mechanics, we switched to the tests on the electronics for the management of the radar, the buzzer and the servo motor, and then to the choice of a battery widely used in the airsoft and easy to find, a Lipo 7,4v battery. During the second prototyping phase, prototypes were made in aluminum and steel by CNC machines to have prototypes as close as possible to the final parts, both for a resistance and weight matters, and to carry out the best tests about efficiency, functionality and durability. Having reached the perfect electro – mechanical system, our attention turned completely to the aesthetic part. Through the creation of pilot molds we were able to obtain parts in ABS almost identical to the final ones. In the third phase, Enimine was field tested, with optimal and surprising results. Sign up for our newsletter and stay updated !